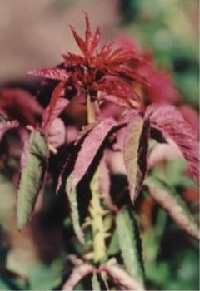 This view of 'TIffany' resembles foliage on the plant amaranthus in its palette of colors. 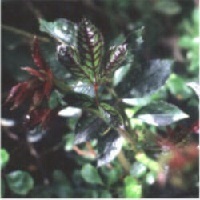 And this photo shows the distorted leaves in context of more normal hybrid tea leaves. 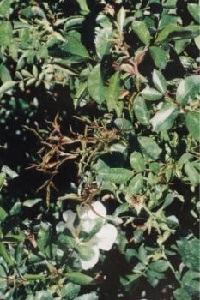 We have seen this discoloration on an rose hybridized by David Austin, as well. ..stem left center grows in a spiral because of one side of the stem being more infected with RRD and growing at a faster rate than the the stem on the inside of the spiral. This Hybrid Tea has RRD within the cane and the emergence of multiple stems from every leaf axil is both excessive and unexpected. The hyperthorniness of the new growth, and the volumn of new stems emerging from a cane of similar caliper is a sign that this rose should ahve been rouged out instead of cut back. 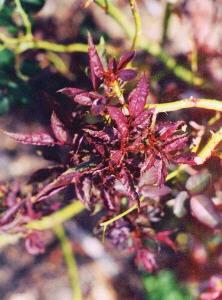 This rosette of pebbly textured misshapen leaves are tightly spaced along a stem, making a rosette of leaves. This was a hybrid tea. The asymmetry of growth on this bush stands out. There's no logical reason for the cane at right to be loaded with new growth, when the canes at left lack new growth. RRD infections in the right cane have caused massive, aberrant growth at right. 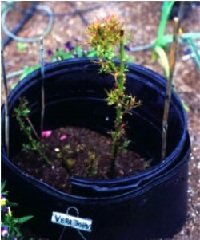 Some roses show RRD when they are uncovered in spring after cold winters. This bush of 'Vera Johns' had tufts of leaves that were too small and undeveloped. Within the rosette of leaves at right there are buds already formed and they have swelling hips without having been fertilized. 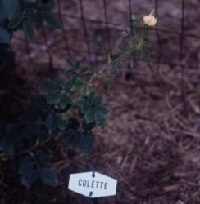 This rose has petals with somewhat normal coloration, but RRD caused the bush to produce a rosette of buds many illogically oriented. 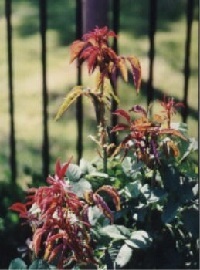 Note the variations in leaf shapes on the same plant as well as the variations in leaf discoloration. The bloom at center has too few petals; it may have been 'Mr. Lincoln' at one time, but no longer makes recognizable blooms. 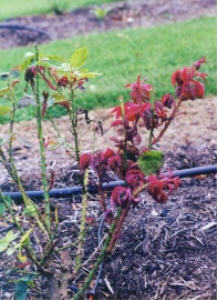 This photo shows the complex color differences on a rose that is becoming consistantly more infected with RRD. 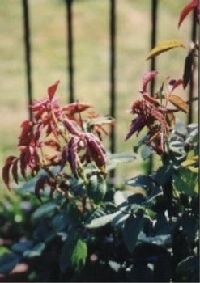 There have been no studies of the variation in leaf pigments as the disease progresses. The AARS selection 'Betty Boop' with different stages of RRD. 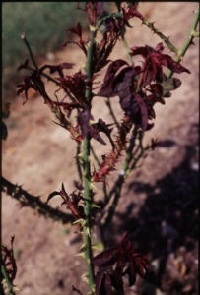 The reddish witches brooms are accompanied on other stems by subsized leaves, and note that the blooms have lost their ability to make consistant reddish orange edges and some make subsized petals on very small sprays. On just one leaf axil on a stem that grew in healthy in 2002, there were eleven stems emerging in 2003 and each stem had sickly leaves with shortened internodal distances. Blooms are reduced in numbers and size. Bloom petals are few in number and misshapen. Royal Botanical Gardens, Burlington, Ontario Canada, August 2003. 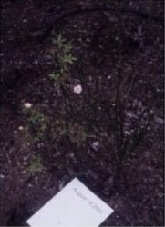 Sick growth was removed from this bush after the viroids were widespread in apparently healthy canes. Multiple witches brooms on 'Reviel Dijonnais'. There are at least three stems emerginf from the original leaf axil. This is excessive growth, given that the next further out leaf axil produces a single stem (at right). The variation in colors is extraordinary, even for spring growth. This may have been the first site of infection for the disease shown below. A comparison of a healthy leaf (left) with a RRD leaf of 'Nearly Wild' shows the mosaic pattern that is red veins in a green leaf. 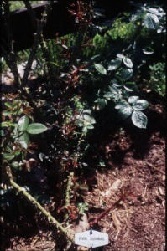 At right normal buds of 'Nearly Wild' show how differenent the peduncle lengths are and how bent the sepals are for RRD sick buds from the same bush. Another view of RRD-style mosaic leaf discoloration. This was on Fuschia Meidiland from our garden. We saw symptoms on 15 Dec 2002 and cut off the cane at the ground. We thought we had saved the rose but this showed up in May 2003. Compare the size and shapes of the rose leaves that look like fern leaves with the more normal leaves in back of them. 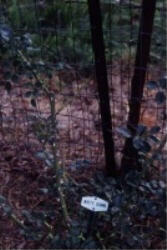 Staunton, VA.
'Starry Night', an award winning shrub has atypical RRD symptoms. The skinny leaves at center are not insect eaten, but are the result of RRD as are the leaves at upper center where the stipules are excessively overgrown. 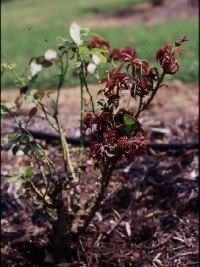 On 'Starry Night' plantings both in South Carolina and Missouri, the reddish colors often associated with RRD are missing and this may be caused by the breeding of this rose that is different from many modern roses. The green canes on this hybrid tea harken back to a time when this rose didn't show RRD symptoms. The cane at right showed symptoms first with every leaf axil producing a stem that is more thorny than the parent cane. One of the canes at left has just begun to produce similar excessive growth. Roses generally have growth that is orderly and predictable; on this rose, the orderliness of the canes decreasing with size is absent since the advent of RRD. Click on this to enlarge it and see the detailed beginning of a witches broom that is not clearly defined by color. This is a hybrid Multiflora, 'Ghislaine de Feligonde' has not yet made the RRD growth so typical of the sick Rosa multiflora in its neighborhood. This is a first sign of RRD. The climber 'Clare Matin' has mottled leaves from whick subsized leaves emerge, and the new growth happens faster than the spray at right. A detail of the Hybrid Musk 'Trier' showing the variable things that can go wrong on one stem: multiple axilary breaks, rosettes, subsized leaves, aa well as very short internodal distances. A parthenocarpic hip terminates an stem where the mite fed on the undifferentiated apical meristem tissue. 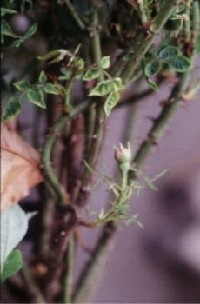 Although this photo is focus-lacking, the excessive growth on one of multiple stems is accompanied by leaves that failed to develop. Click on this photo to see the spray of blooms on the larger flowered climber 'Rhonda' when the buds fail to develop due to RRD. Note the small petal count on the one bud where the sepals have folded back. 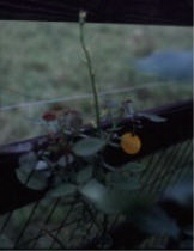 The thin stem at right has not lost its foliage to plant-eating insects; it's leaves never formed due to RRD infecting that stem but not yet affecting the other 'Altissimo' stems to the left. Spring growth on 'Reveil dijonnais' were rosettes of misshaped leaves at all leaf axils on the center cane as well as aberrant growth from where canes were pruned off. 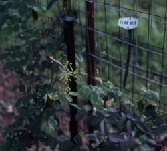 This plant of the climber 'White Dawn' had remedial pruning on the cane at left center; tufts of leaves are emerging from every leaf axil below the cut. Rose bushes are supposed to have large leaves that support beautiful blooms. This bush may have been a hybrid tea before RRD infected it. 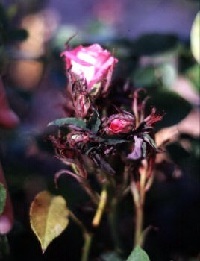 'Trier' is the parent of many Hybrid Musk roses and here shows very early symptoms of RRD infection with aberrant growth appearing at the ends of some of the canes. Infection-influenced growth happened after the formation of the blooms. 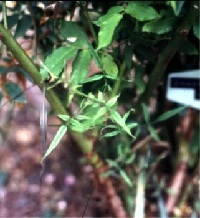 Normal cane development on the climbing rose 'Don Juan' is long and big canes with widely spaced leaves. This looks down on a rosettes of leaves on a subsized stem. 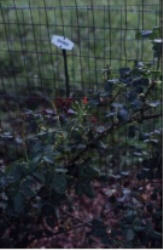 This rose was ten feet from the 'Trier' at left, and so was suspect. A further look at the 'Don Juan' at left shows subsized leaves that have short internodal distances on an additional cane. 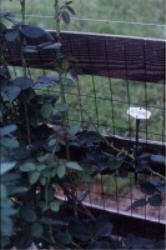 Some roses will produce canes that will be abandoned, but the location of this cane in a garden with RRD on many other roses, made this roses suspect. 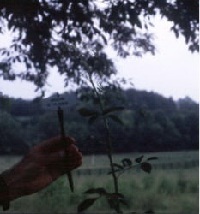 Viehmeyer (1961,p.99) noted that "in roses having the germplasm of R. spinosissima the thorniness is increase, often to the point of the stems being 'furred' with thorns." This photo was not used in The American Rose. Closeup of "infected fruiting branch" of Rosa eglanteria (below center). Note that the buds are overgrown by foliage; on healthy R. eglanterias the blooms open with foliage in the background to make it easier for the bees to find the flowers. 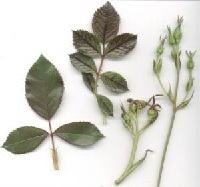 Close up of "infected young shoots" of Rosa eglanteria (below center). 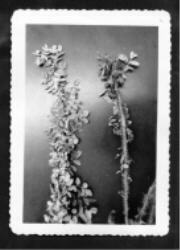 This print was not used in the 1961 paper, but seems to be a different view of Rosa hugonis with normal at left and infected at right. 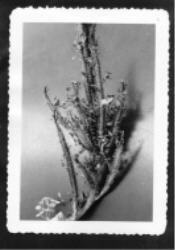 A print of this photo appeared in Viehmeyer, 1961, p.6l. 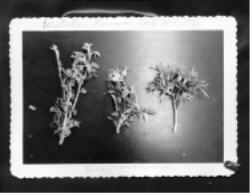 "Shoots of Rosa eglanteria", left: "infected young shoots", center: normal fruiting branch, right: "infected fruiting branch"
The Pictures in this grouping are the origional pictures from the RRD outbreak in North Platte in the late 50's. 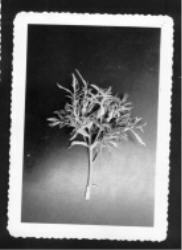 The photo at lower, center is labeled " Witches Broom No. Platte" and below the photo is written: "Mutliflora" This photo was published as Rosa eglanteria, which it probably was,as multiflora has much smaller seeds regardless of the health of the rose. 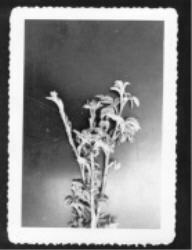 Although these photos are black and white, there are details that show rosette tufts of leaves, parthenocarpic hips, differences in thorniness of adjacent stems.